It was Christmas Eve. The streets of central Paris were crowded with citizens. Some were shopping, some were eating and some were drinking. Others were plotting murder. Between the Tuileries and the Louvre a group of extremists were preparing to set off a bomb. They had wheeled their improvised device into town earlier that day, parking it opposite a wine bar, and were now nervously checking their watches. Then, amongst the milling crowd, they saw their target appear then approach. Despite knowing that their bomb would kill indiscriminately, there was little hesitation and the fuse was lit. It was just after eight that evening when an enormous explosion wreaked havoc in the confines of Rue Nicaise, killing and maiming and destroying. The target for this early act of terrorism had been the coach carrying Napoleon Bonaparte, a man who had come to power in a coup the year before and who consequently found himself the enemy of republicans and royalists alike. The terrorists belonged to the royal faction and although they failed to kill Napoleon that Christmas Eve, their atrocity hurled political violence in a new and terrifying direction. Towards a now familiar place where civilian casualties would be collateral damage and where bombs and IEDs in packed streets and squares would be the new agents of terror. Whilst Napoleon launched the hunt for those who had so nearly killed him, the novelty of terrorism presented a baffling case for the regime’s security services. Whilst they strove to solve it, deploying the rudimentary arts of detection in the hunt for the perpetrators (their best clue was a horseshoe), Napoleon made use of public anger and press hysteria to crush what remained of political opposition to his rule. 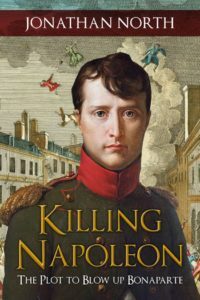 This book looks in detail at the plot to kill Napoleon. It sets the scene with Napoleon’s coup and then delves into the clandestine world of cloaks and daggers as the royalists mobilise for the First Consul’s murder. We follow this cell of extremists as they prepare their ground meticulously and devise a bomb which will go down in history as the Infernal Machine. The device goes off and we then switch track and follow the vengeful state and its agents as they seek to hunt down the men who had tried to kill Napoleon. Using first-hand accounts, trial transcripts and archival material, and with all the drama of a detective story, Killing Napoleon recounts one of the great crimes in French history. A story that is largely unknown in the English-speaking world but one which will resonate as we endure our very own age of terror.